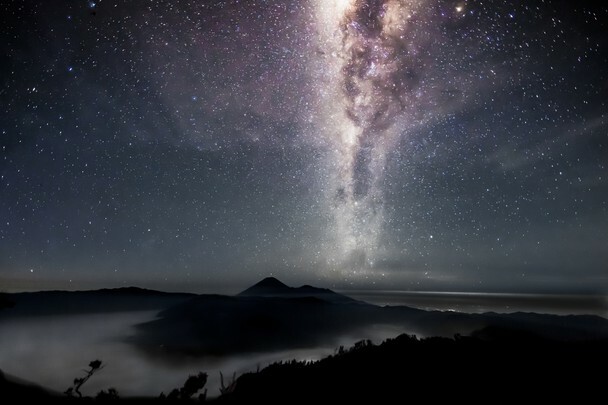 Mount Bromo Milky Way Tour by Camping is an astronomy photography package, wherein the photographers usually looking for galaxy position on the highest peak along night. the process for Mount Bromo Milky Way not enough for short time, You must able stand your tripod begin 09.00 PM until 04.30 PM to create the perfect the Milky Way picture. In conjunction with the duration of Bromo Milky Way photography process, We provided Mt Bromo Milky Way photography package by Camp, because of the temperature on the highest peaks between 03 - 05 degree centigrade or very cold. In this time, You will stay 1 night by camp on the high peak, enjoy hot tea, coffee or snack, while waiting for the Galaxy position using special photography tools have You prepared. Mount Bromo Camping tour package will give better atmosphere whenever You need to shoot the Galaxy all nights from the campsite. Also, give much opportunity feel the natural atmosphere of Mt Bromo national park especially for Mt Bromo sunrise. Some travelers prefer to choose to take the Mount Bromo Milky Way Photography from nearby hotels because they have known that the temperature on the highest peak is very cold. Pananjakan known as the highest peak with elevation at 2,770 meters high, Pananjakan Peak is the most recommended place for Mount Bromo Camping tour 2 days 1 night during the Milky Way tour at Mount Bromo peak but the tourist recommended using the private jeep 4 WD from Cemoro Lawang because the route to this peak is very steep, Pananjakan not only good for the Milky Way photography package, but also good for Camping and sunrise photography. From Pananjakan, You will also able see Semeru volcano summit have known as the highest volcano in Java Island Indonesia. If You are interested to try Semeru volcano hiking, You can choose on April - November because start december - march normally closed due to rainy season. Kingkong peak located lower than Pananjakan viewpoint, Kinkong place has 2,750 meters high, Kinkong Hill also recommended place for Mount Bromo camping tour package for Photograph. from Kingkong plateau, You will also able to see the sunrise and Crater rim but You must using the organized jeep 4 WD because steep route and location still one way toward Pananjakan. Seruni Point known as the second place to enjoy Mount Bromo Stargazing Photography by Camp, the location is not too far from Cemoro Lawang, If You visit the Seruni Point by trekking, the trekking durated 2 hours. Make a camp on Seuni Point also give You much chance to see the Stargazing appearance because this top have good place to see the Milky Way, Sunrise, Crater and other views. Milky Way Photography must be supported with the camera setting manually and the technique of Long Exposure Wherein the shutter speed/exposure time can be set up to a few seconds. The night sky must free of light pollution. It is meant that, the night sky must free of city lights and the sky clean of air pollution (smog), cloud and fog. Raw image quality into RAW + L or adjust memory capacity may use the Small , Medium or Large. Before You choose the Mount Bromo Camping package for Milky Way Photography, You must prepare Gloves, Jacket, Hat, Long Pants because on the camp place the temperature around 05 - 07 degree centigrade and dont forget to complete your camera tools that support with the Milky Way Photography tour.